Build A Haven For Your Hens!
" Get Instant Access To 10 Complete Chicken Coop Designs! " My name is Gina Read and for the last 10 years I have been the editor of the Keeping Chickens Newsletter. Being a part of our community of 1000s of wonderful chicken keepers is great for some general coop ideas, photos and advice but often some of the essential construction details and building dimensions are missing. The trouble with searching for the best chicken coop plans, is that what is best for one person is not necessarily so for another. 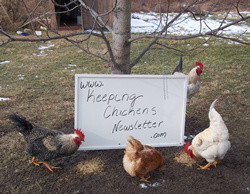 During my years of publishing the Keeping Chickens Newsletter I have had several sets of coop designs drawn up which have successfully been used in building many backyard chicken coops and runs and have housed many dozens of happy hens (and likely a few roosters as well). I have put together a collection of chicken coop designs that I hope will help everyone to get the backyard coop that they want. Available for instant access in pdf format these guides include the diagrams, materials lists, illustrations and instructions for how to make each chicken coop. Perhaps more importantly, these are not just ideas for coops, but real coops that have actually been built and used. Use a plan 'As Is' or just pick and choose the ideas you like from the plans available to build your own 'poultry palace'. 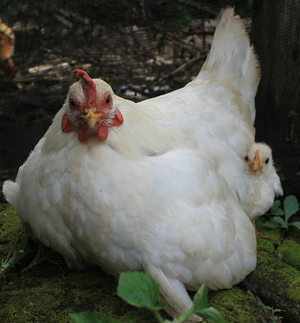 Keeping some hens in your garden can be a wonderful experience for the whole family. Chickens are full of character and can make lovely pets. They will follow you around 'helping' you with the gardening if you are doing a bit of digging or weeding and keep the area free of bugs. The thrill of opening the nestbox and finding your first egg can't be beaten - and even now, finding eggs in the nesting boxes each day is still a joy. Whether you are raising a small or large flock, your backyard chickens will have the same fairly simple requirements for care; a supply of food and clean water, a comfortable, dry and draft free structure for living in with some outdoor space for them to peck about in and enjoy the fresh air and sunshine whenever they can, together with a regular cleaning routine to give them a reasonable level of sanitation. It's true, you could potentially save hundreds of dollars with a homemade hen house - and sometimes build one almost for free if you use reclaimed materials and hardware tools you already own - but this isn't just about saving money by doing a bit of diy and building your own coop, it is also about making the coop you want to have in your backyard, the way you want it. For less than the normal cost of just one chicken coop plan you can gain instant access to this complete collection of coop plans. Click the add to cart button below now - you get them all for just $17! My 60 Days, 100% Satisfaction Guarantee! I truly believe this is the best collection of real 'actual chickens have lived in these' plans for building your own chicken coop available on the web but if for any reason you are not happy with your purchase just drop me a line within 60 days and i'll refund every penny of your money back. The risk is entirely on me. Fair enough? (as well as any added in the future). Your payment will be processed securely by Clickbank. P.S. When ordering my sets of backyard chicken coop plans today you will be getting 10 complete designs for less than the usual cost of just one. P.P.S: Remember...you have my 100% Risk Free Money-Back Guarantee. If for any reason you are not happy with this collection of chicken coop plans, just let me know. Your investment is guaranteed for a full 60 days.